Another recipe from Fitness Food tonight — seems like every recipe we’ve made from this book is a winner. 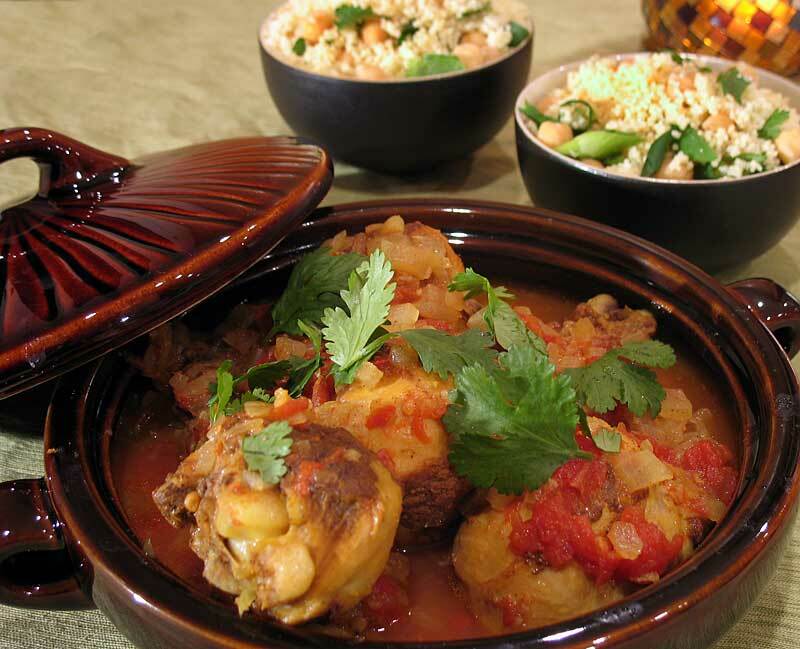 This time, chicken drumsticks are slowly simmered in a tomato and chicken broth-based sauce and served over couscous with chickpeas, green onions, and cilantro. It was a nice departure from the ever-present chicken breasts we usually cook with. Yay, we get to be cavemen! The chicken is on the bone. Ahhh… I get ya. Did you ever go for the giant turkey drumsticks at state fairs? Uh, no. The last thing I’d want to do is stand around in public ripping meat off a bone with my teeth. …THIS is different. This is delicious, and I can use a fork. And I can’t get enough of the sauce. Such a good flavor! Agreed — and the recipe made a TON of couscous. Those four servings are mighty generous. I really like the couscous. It would go well with a lot of dishes, especially those that have a bunch of sauce to soak up. In a small frying pan over medium heat, place the cumin, coriander, ginger, turmeric, cinnamon, and chili flakes and dry roast for about a minute until fragrant. Grind using a spice grinder or mortar and pestle. Sprinkle the chicken drumsticks with the spice blend, rubbing in well. In a large, deep, frying pan, heat 2 tsp of the oil. Add the chicken and cook for 8 minutes, turning to brown evenly. Remove and set aside. In the same pan, add the remaining oil and over medium heat cook the onion, garlic, and ginger for 3-4 minutes, until softened. Add the tomatoes, chicken stock, and the chicken to the pan, and bring to a boil. Cover, reduce the heat to low, and simmer for 45 minutes until the chicken is fall-off-the-bone tender and the sauce is reduced. Season to taste. Meanwhile, to prepare the couscous, boil the chicken broth and garlic in a small saucepan. Put the couscous in a glass bowl, cover with the boiling chicken broth, and cover the bowl with plastic wrap. Let sit for 15 minutes. Chop the green onions, and rinse and drain the chickpeas. Stir the couscous with a fork, and add the green onions, chickpeas, and cilantro. Serve on a platter topped with the chicken and sauce. Tonight Lisa made a stew and couscous combo adapted from a recipe found on the Food Network website. 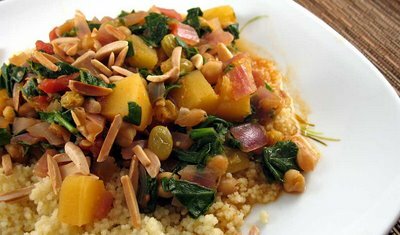 Acorn squash, spinach, garbanzo beans, onions, tomatoes, and spices over a bed of couscous. What’s not to [heart]? This one is especially delicious. …and colorful. Also, I love how the couscous soaks up the sauce. It rules, though, you know, I think my dad and brother would hate this dish. They don’t like sweet things in savory dishes. That’s my favorite part about this one, I’m seeking out those little plump bursts of sweetness! Yum! Thanks Food Network! Heat the oil in a medium saucepan over medium heat. Add the onion and cook, stirring occasionally, until soft and golden, about 10 minutes. Add the garlic, tomatoes, and spices and cook until the cinnamon stick unfurls and the tomatoes are cooked down, about 3 minutes. Add the squash, chickpeas, broth, lemon zest, and raisins and bring to a simmer. Cook, partially covered, until the squash is fork tender, about 25 minutes. Stir in the spinach and cook until wilted, about 3 minutes. Add the lemon juice and season, to taste. Meanwhile, make the couscous. Bring the broth to a boil with the salt and pepper in a small saucepan. Stir in the couscous, pull the saucepan off the heat, cover, and set aside until the water has been absorbed and the couscous is plump, about 5 minutes. Fluff the couscous with a fork and mound it in 4 soup bowls. 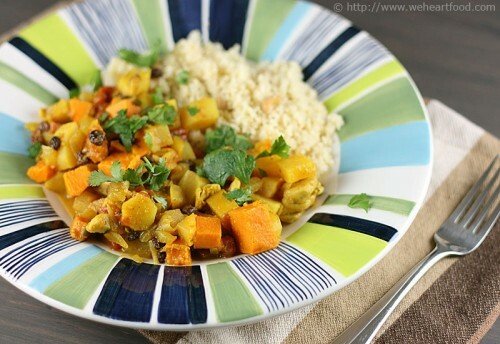 Spoon some butternut squash stew over each portion, top with almonds, and serve. A full plate courtesy of the Moosewood Low-Fat Favorites cookbook. 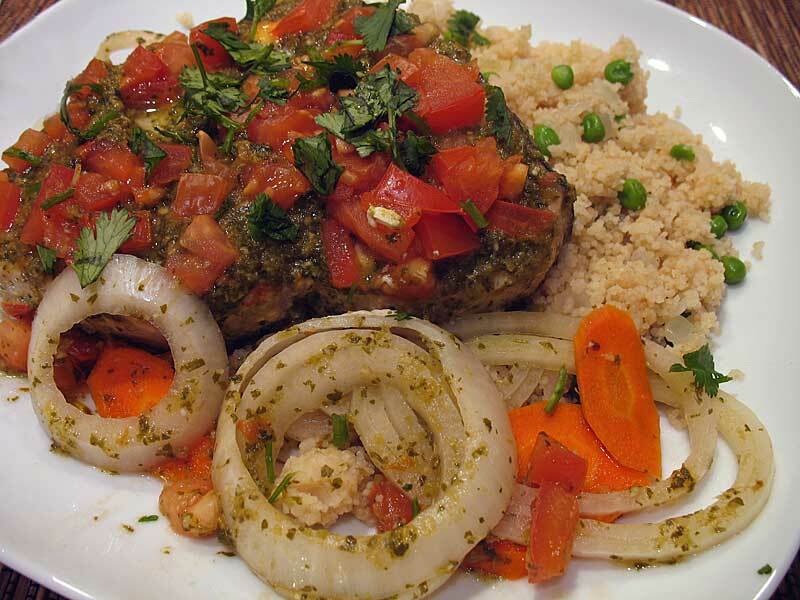 Swordfish is baked in a lemony cilantro sauce with onions, carrots, ginger, garlic, and tomatoes. We served it over a couscous with onions and peas, a recipe also from Moosewood. And cilantro-y! I love that sauce. Wow, I can’t believe I ate this whole thing, but it actually seems pretty light! It is pretty light — the fish is just baked with lemon juice, herbs, and vegetables… definitely keeps the fish moist. Rinse the fish fillets and set them aside. Prepare a glass baking dish with cooking spray or oil very lightly. Arrange the onions and carrots in a layer to cover the bottom of the dish and place the fillets on top. Lightly sprinkle them with salt. 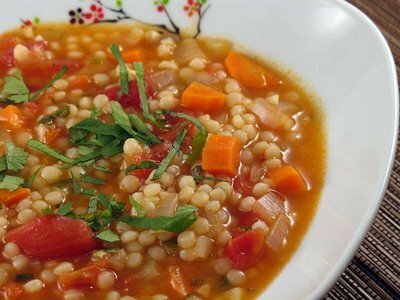 In a blender or food processor, combine the cilantro, garlic, ginger, cumin, lemon juice, chile and half the chopped tomatoes and puree for form a smooth sauce. Add salt to taste. Pour the sauce evenly over the fish and vegetables and top with remaining chopped tomatoes. Cover tightly with foil and bake for 30 to 40 minutes, until the fish flakes easily with a fork (about 140F internal temperature).